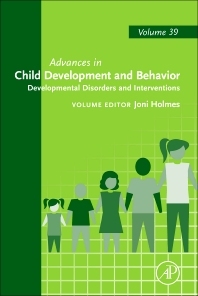 Volume 39 of the Advances in Child Development and Behavior series is concerned with Developmental Disorders and Interventions. This volume provides an overview of contemporary research into cognitive, neurodevelopmental and genetic disorders of learning. The social, emotional and cognitive functioning of children with William’s syndrome, Down syndrome, Fragile X and autism, reading difficulties, mathematical difficulties and working memory problems are discussed by some of the leading researchers in the field. Within each chapter, the authors consider current interventions and methods for remediating difficulties associated with each disorder, which will be of particular interest to clinical and educational practitioners.